The Jamaican men’s national team has included six MLS players for its CONCACAF Nations League qualifier against El Salvador tomorrow, Saturday, March 23rd. FC Cincinnati’s Darren Mattocks and Alvas Powell, the Philadelphia Union’s Andre Blake and Cory Burke, the New York Red Bulls’ Kemar Lawrence and LAFC’s Peter-Lee Vassell are on the Reggae Boyz’ squad for the crucial match. Jamaica has won their first three CNL qualifiers and are guaranteed a place in this summer’s CONCACAF Gold Cup with at least a point in El Salvador. They will also earn qualification into League A of the CNL with a point. Former West Indies skipper, Clive Lloyd and former West Indies great, Sir Andy Roberts, have endorsed the challengers for the leadership of the West Indies Cricket Board. The current West Indies Board President, Dave Cameron, has already served two terms and many say his leadership has left much to be desired just like the West Indies cricket teams’ performance. The Jamaican national, who has been in the post since replacing Julien Hunte on March 27, 2013, is facing a serious challenge this year. Former St. Kitts and Nevis minister and West Indies team manager, Ricky Skerritt is challenging Cameron for the post. The election for President and Vice President of the West Indies Cricket Board is set for Jamaica on Sunday, March 24th in Jamaica. But so far, however, Skerritt and Shallow have only been publicly endorsed by the Trinidad and Tobago and the Leeward Islands’ cricket boards. Barbados, Guyana, and Windward Islands are expected to cast their lot with the much-disliked Cameron despite the state of West Indies cricket and the disgust of fans. The direction of the vote of the Jamaica board is not known but could prove critical to the outcome of the election. The Jamaica board is headed by president Billy Heaven who reportedly has not always seen ‘eye to eye’ with Cameron. TMZ states $2 million is the figure in contention. Jean states he signed an agreement with the sisters’ father, Leonard Francois, in March 2012 after the latter reportedly swapped out unaffordable coaching payments for a contract that would put the aforementioned percentage of money as it pertains to tennis into Jean’s account indefinitely. In a statement on the matter, Osaka’s attorney Alex Spiro claims this lawsuit holds no weight. “While it comes as no surprise that Naomi’s meteoric rise as an international icon and inspiration would lead to some false claim, this silly, imaginary contract that Naomi never saw or signed—which purports to give away part of herself at the age of 14—is particularly absurd,” Spiro said as noted by the South Florida Sun-Sentinel. Jamaica’s Reggae Girlz will be one of four newcomers to soccer’s global showpiece, the FIFA Women’s World Cup, which gets underway on June 7, 2019 in France. The team is continuing its preparations to ensure its readiness for their opening match versus Brazil on June 9th in Grenoble. 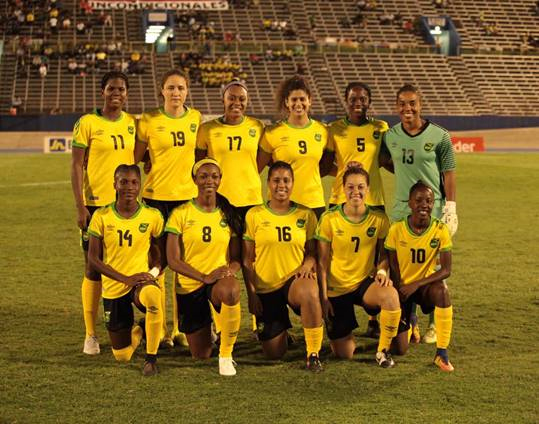 Following their recent two-match series win over the 38th ranked Chileans, the Reggae Girlz will now turn their attention to their upcoming training camp from April 1-9 in South Africa where they will play South Africa’s national team. The team will then play their final match in Kingston versus Panama on May 19 before departing for the World Cup. For more ion Jamaica’s Reggae Girlz, go to www.reggaegirlz.com.